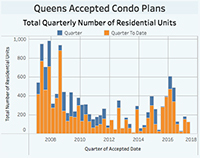 Developers received the green light to market about $400 million in condominium projects in Brooklyn during the second quarter, which is down about $900 million year-over-year, according to a TRData analysis of condo plans approved by the New York State Attorney General’s office. 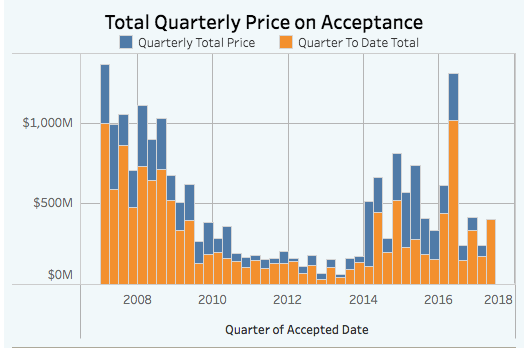 In the second quarter of 2016, developers of 48 projects in Kings County shot for the moon with a cumulative accepted price of $1.3 billion, by far the most seen this cycle. (In fact, in the last decade, only the first quarter of 2007 had a higher projected sales volume at $1.36 billion.) In the second quarter of this year, Brooklyn developers have received approval for 37 projects with a total accepted sellout of $403 million. Only one of those projects is targeting a sellout north of $50 million. Still, Brooklyn’s second quarter’s figures look much better than the first quarter of 2017, where accepted condo volume was just $241 million. 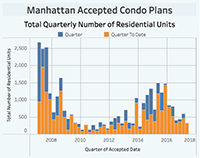 As The Real Deal previously reported, demand for Brooklyn condos is strong, but sky-high land prices and tight lending could prevent developers from adding supply in the future.